Early tomorrow morning we're off to San Diego for our nephew's graduation! Yay!! We're so excited for him. This graduation is the start of our very busy summer. 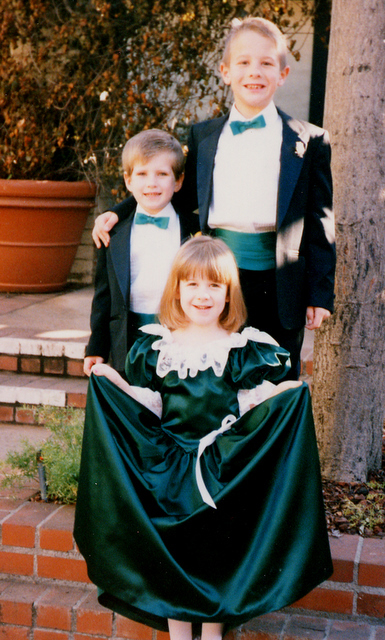 The older nephew in the photo is the one graduating from the University of California, San Diego this weekend. He was our Jr. groomsman at 7 years old. It's amazing that he's now older than when Jimmy and I got married. Ohhhh. Don't you love pics like this that bring back so many memories! San Diego was "my" city for 7 years back in the 70s and where my 2 kids were born. Have a great trip! Graduations are much harder to sit through than weddings. Hope they have a great speaker, good air-conditioning, and comfortable seats (oh, and less people than a large city graduating). Oh Madz I'll miss you, but have fun. I did the meme but don't have 7 people to pass it on to. Why would you need AC in San Diego? I'll get to the meme in a few days, meanwhile have a great trime in San Diego, see you when you get back!